Parkinson's disease is a neurodegenerative disorder that affects dopamine-producing neurons in the part of the brain called substantia nigra. This disease is very diverse, meaning that the progression of symptoms can vary from one person to another. It is very important to try and catch the early symptoms of this disease so you can talk to your doctor about what you can do to create a plan to stay healthy and delay any further symptoms. Listed below are the top 10 early signs of Parkinson's. Tremor- Have you noticed any shaking in your hands or fingers while you are at rest? This could be an early sign of Parkinson's disease. Please note that it is natural to have shaking in your hands or fingers after a lot of exercise or after taking some medications. Small Handwriting- Has there been a change in the way you are writing? There may be a change in the size of your letters or you may be crowding your words because of a sign of Parkinson's disease called micrographia. Loss of Smell- Have you noticed you can't smell common foods as well as you did before? If you are having trouble smelling foods such as pickles, licorice, and any other common food items then you should go see your doctor about possibly having Parkinson's. Trouble Sleeping- Do you move a lot when you are in a deep sleep or act out dreams? You may want to ask your spouse about this because they may move to another room at night. 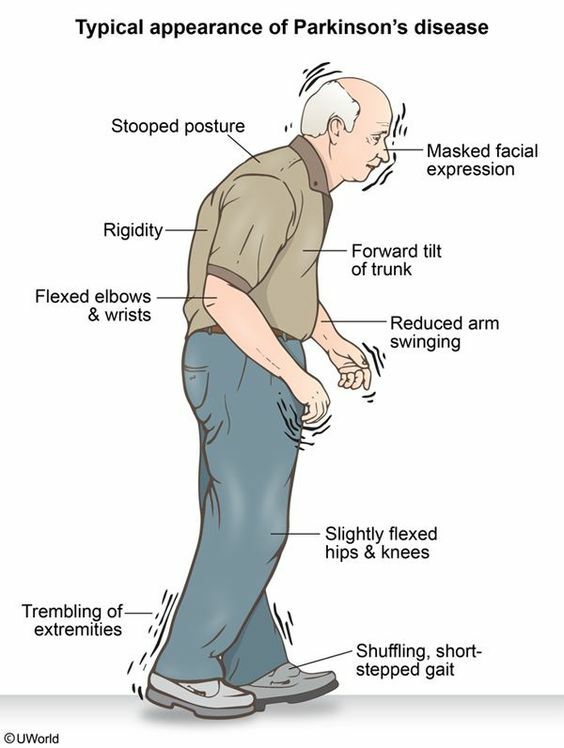 These movements could possibly be an early sign of Parkinson's disease. Trouble Moving or Walking- Has there been any stiffness in your arms or legs? Do your arms not move as much as they used to when you walk? Some early signs include stiffness in the hips or shoulders. Constipation- Have you been having colon problems? If you are straining to move your bowels then this is another possible early sign of Parkinson's. A Soft or Low Voice- Does your voice sound softer or hoarse? If these changes have occurred then you should go see a doctor. Some people think others are losing their hearing but really it is them who are talking a lot softer. Masked Face- Have you been told that you have a depressed or mad look on your face even when you are in fact in a good mood? This is called facial masking and you should approach your doctor about this. Dizziness or Fainting- If you feel dizzy or have fainted then this could be a sign of low blood pressure and this can possibly be linked to Parkinson's disease. Stooping or Hunching Over- Are you not standing straight up and have bad psoture? If anyone notices that you are leaning to one side, slouching, or stooping when you stand, it could be an early sign of Parkinson's disease and you should talk to your doctor. People with memory loss or other possible signs of Alzheimer’s may find it hard to recognize they have a problem. Signs of dementia may be more obvious to family members or friends. Anyone experiencing dementia-like symptoms should see a doctor as soon as possible. If you need assistance finding a doctor with experience evaluating memory problems, your local Alzheimer's Association chapter can help. Early diagnosis and intervention methods are improving dramatically, and treatment options and sources of support can improve quality of life. Two helpful support resources you can tap into are ALZConnected, our messages boards and online social networking community, and Alzheimer's Navigator, a web tool that creates customized action plans, based on answers you provide through short, online surveys. Heavenly Helpers Assistance, LLC Grand Opening! As of Friday, June 9th, 2017, Heavenly Helpers Assistance, LLC will be open for business and ready to accept new clients. Heavenly Helpers Assistance, LLC is a private non-medical homecare health agency offering assistance to ALL ages of individuals with limited ability needs. Our mission is to provide unequivocal, excellent private non-medical home care health and customer service needs to all who face limited mobility, and desire a full productive living style. Initially, we plan to service all of the Greater Atlanta area including North Georgia, Paulding, Douglas, Fulton, Dekalb, Gwinnett, Cobb, Henry, Carroll, and Clayton county area residents. Here at Heavenly Helpers Assistance, LLC, we are passionately committed to the care of those who unfortunately lack the mobility required to live a full life; without restrictions. We will strive to provide Uncompromising, Excellence, and Commitment to Care to ALL who need living assistance. Click here to view the services we currently provide. Please give us a call at our office number 678-981-4673 and our 24/7 assessment line at 678-922-9294. By customizing your non-medical service needs, a schedule is formulated to enhance a comfortable, healthy lifestyle for you or your loved ones. We are dedicated to providing an affordable alternative compared to other non-medical home care agencies; which allows our clients to remain in their own homes. JOIN US IN OUR JOURNEY TO PROVIDE LIVING ASSISTANCE CARE TO THOSE WHO NEED IT THE MOST!